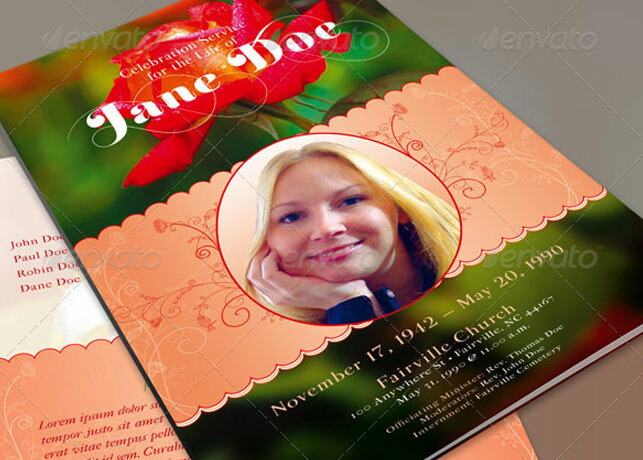 Obituary Templates are for a memorial or funeral services. Great for memorializing a person that passed away. When a person dies, close family members or friends arrange a funeral program to represent the family and more importantly, the one that passed away. 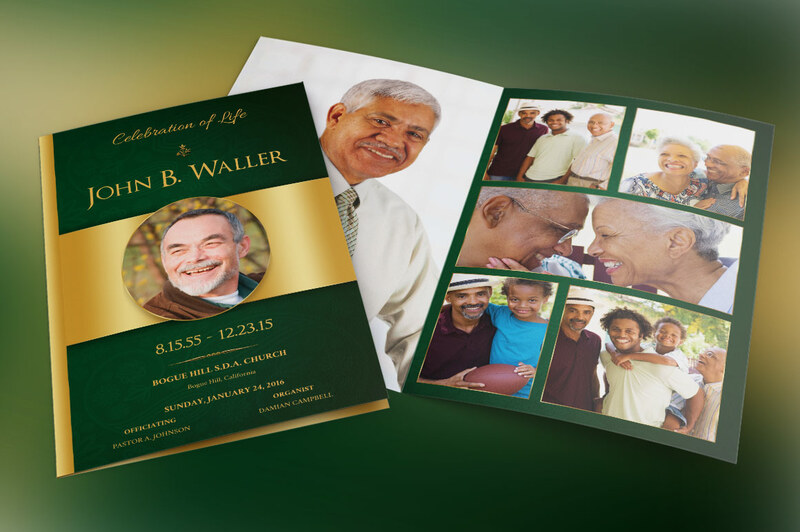 Obituary Funeral Program Templates are used to present to the guests, the order of service, obituary and interment along with other information is included. Cut cost and save time with these templates – they are designed already, just enter they needed information. 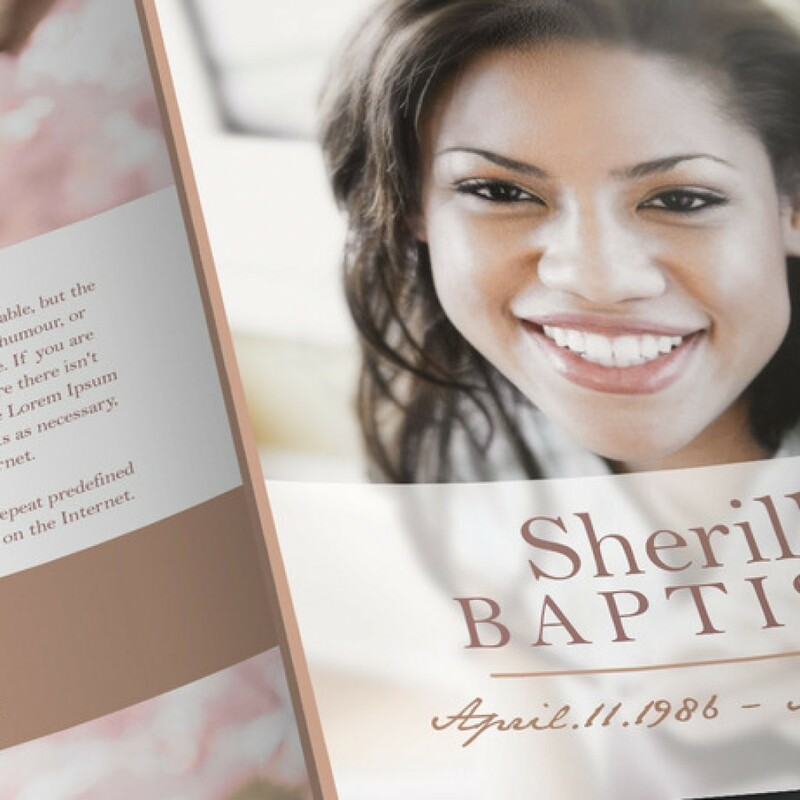 Printable Obituary Templates designed with care and professionalism can make a great keep sake for those that are mourning. 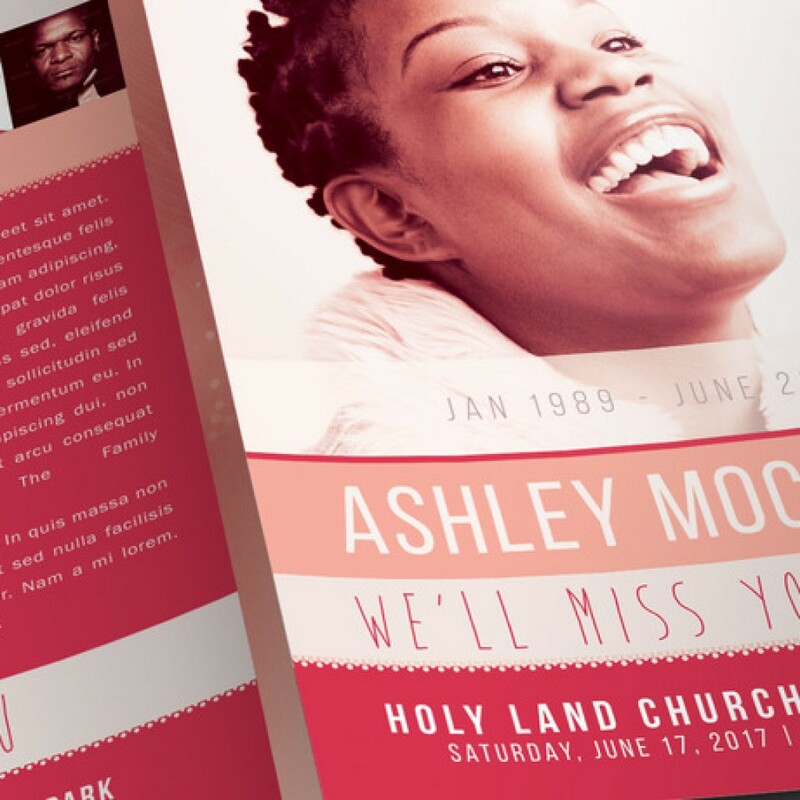 These Printable Obituary Templates are great for doing just that. They can also be customized for wedding and anniversary events for anyone needing a unique program. 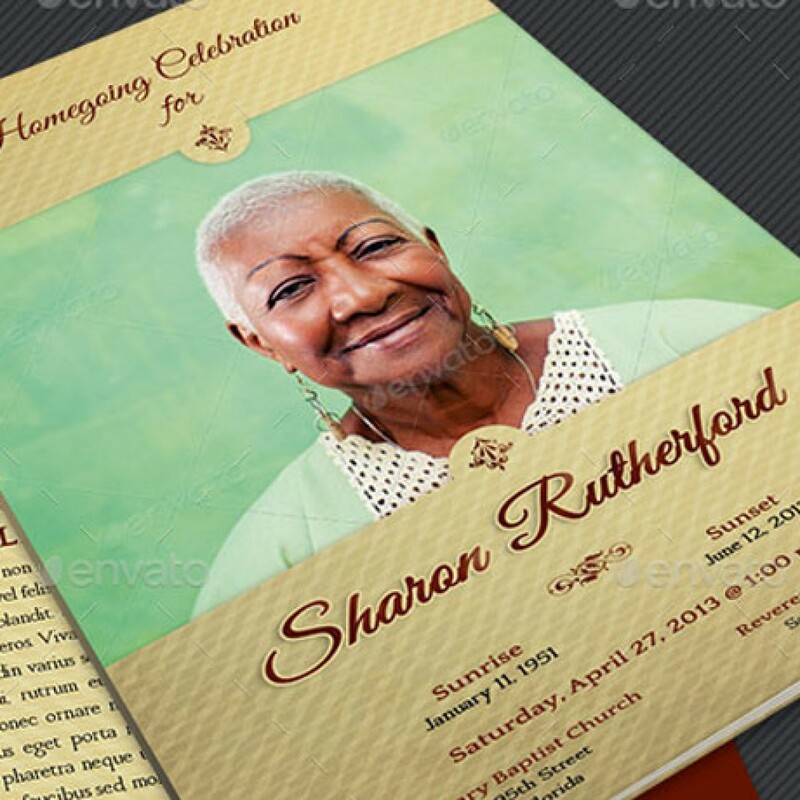 Vintage Sky Funeral Program Publisher Template is for funeral, home going or memorial service. Designed specifically for male funerals but can be edited for female funerals and other events like weddings and receptions. 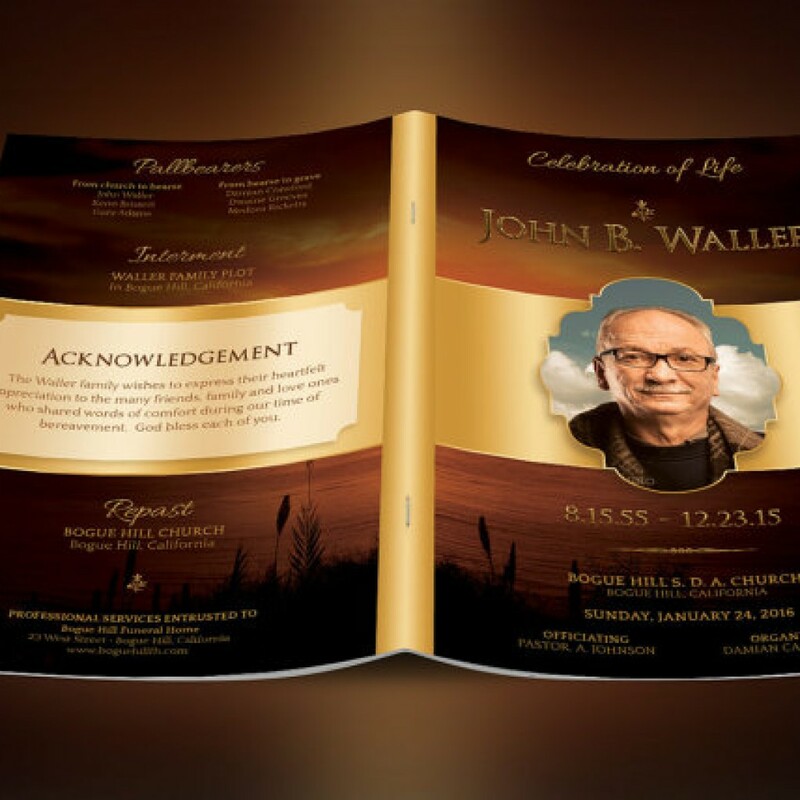 Obituary Funeral Program Change the sky background to match your loved ones style. 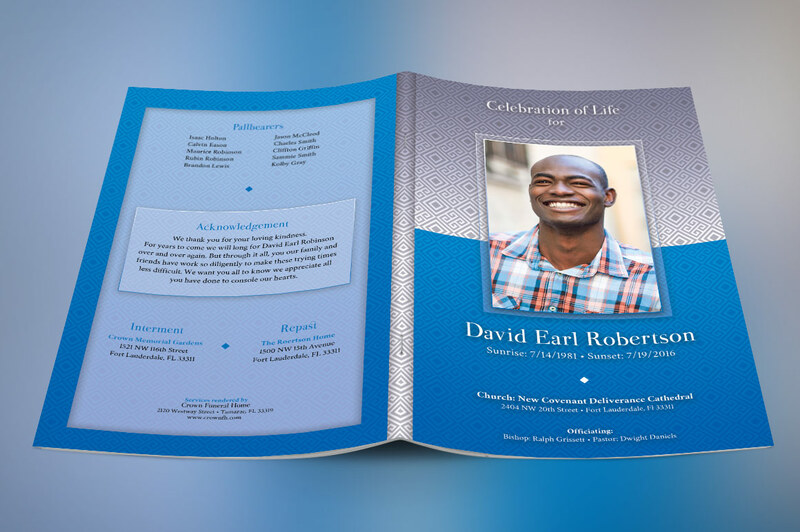 Turquoise Funeral Program Publisher Template is bi-fold brochure for a memorial or funeral services. 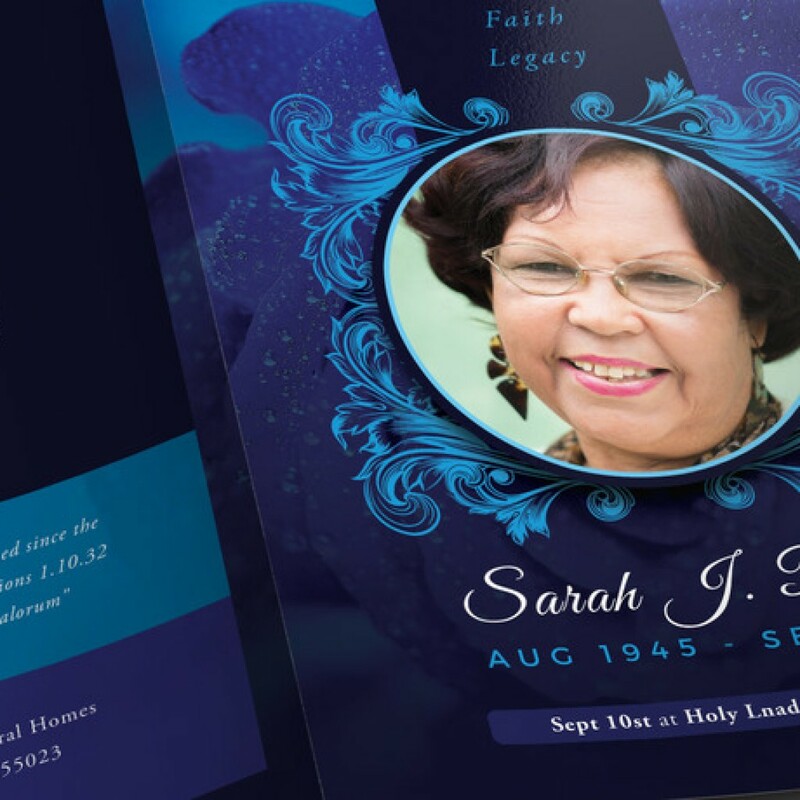 The polka dot patterns and solid shapes in this Obituary Funeral Program combined with beautiful serif text, makes the program suitable for other elegant occasions like weddings, anniversaries, baby showers etc. 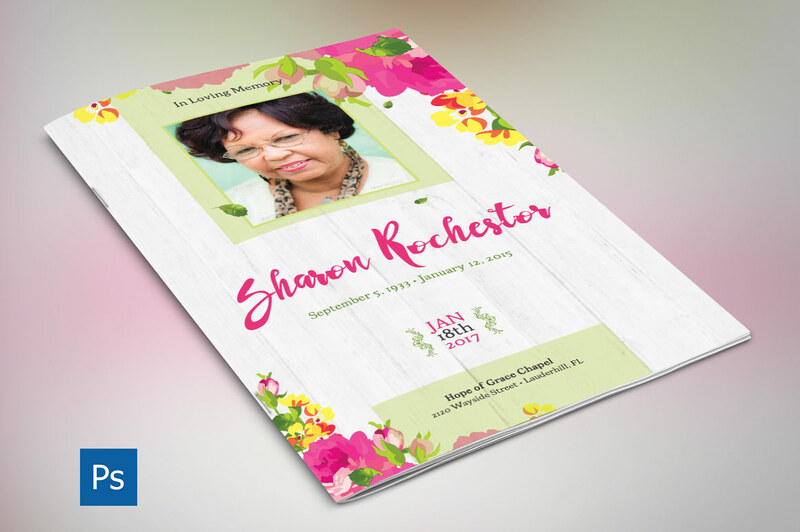 Pink Watercolor Funeral Program Publisher Obituary Templates is for a memorial or funeral services. The watercolor flowers in this Obituary Funeral Program combined with decorative text, lends itself to this and many other occasions like weddings, anniversaries, baby showers etc. This program can also be edited and used as a greeting card. 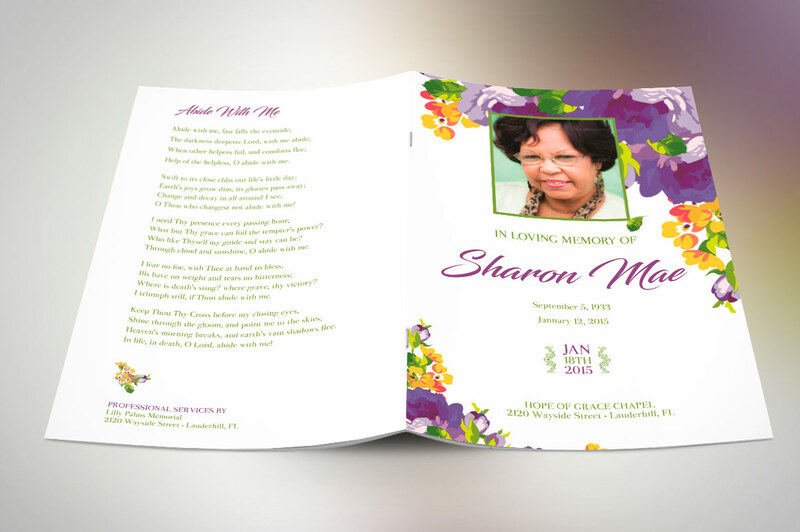 Purple Watercolor Funeral Program Publisher Obituary Templates is for a memorial or funeral services. 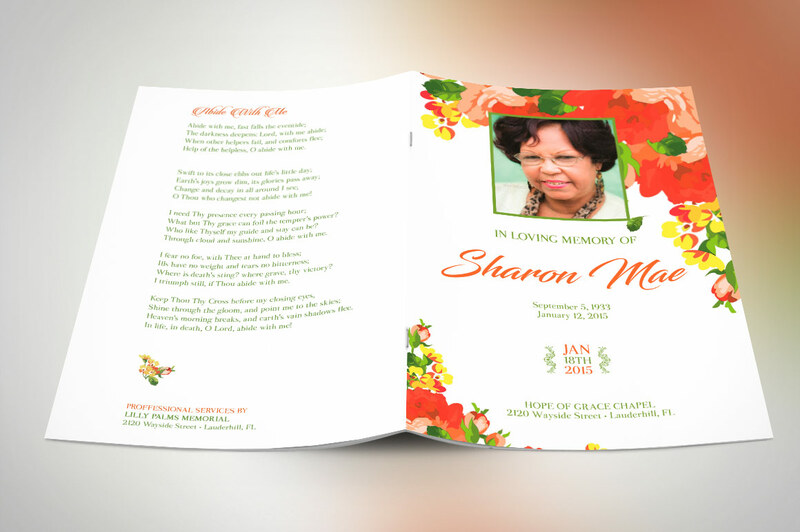 The watercolor flowers in this Obituary Funeral Program combined with decorative text, lends itself to this and many other occasions like weddings, anniversaries, baby showers etc. This program can also be edited and used as a greeting card. 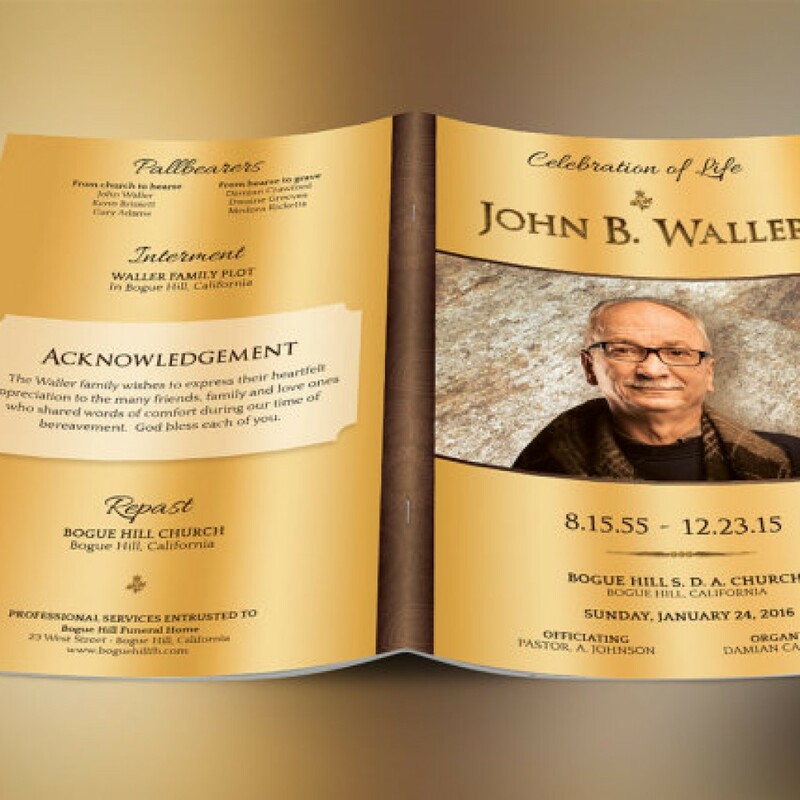 Orange Watercolor Funeral Program Publisher Obituary Templates is for a memorial or funeral services. 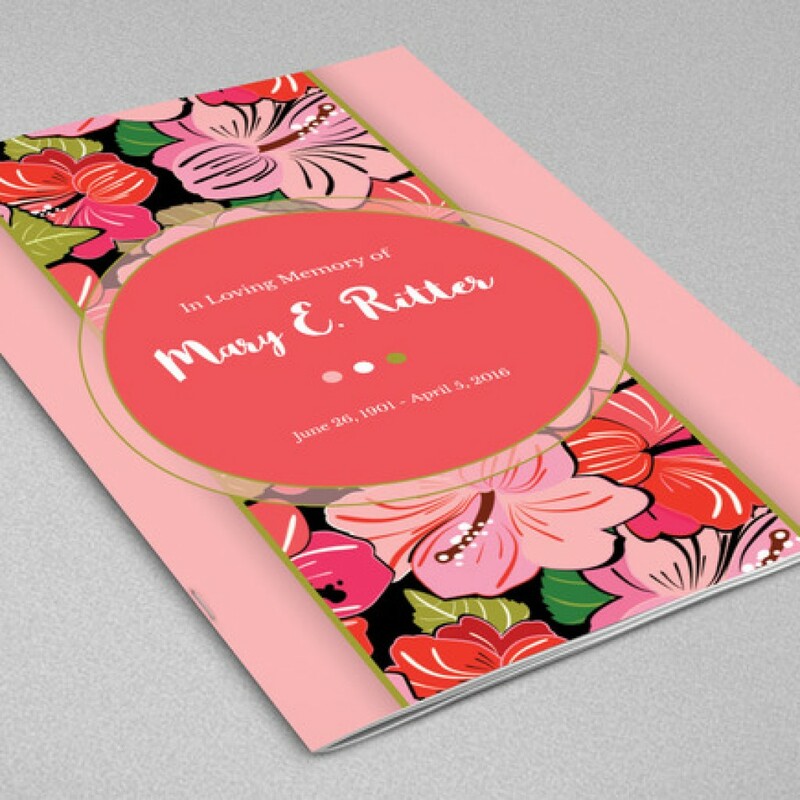 The watercolor flowers in this Obituary Funeral Program combined with decorative text, lends itself to this and many other occasions like weddings, anniversaries, baby showers etc. This program can also be edited and used as a greeting card. . Autumn Floral Funeral Program Photoshop Template, created with Photoshop, is for a memorial or funeral services. The watercolor flowers combined with modern decorative text, lends itself to this and many other occasions like weddings, anniversaries, baby showers etc. This program can also be edited and used as a greeting card. 4 color options are included for easy application. 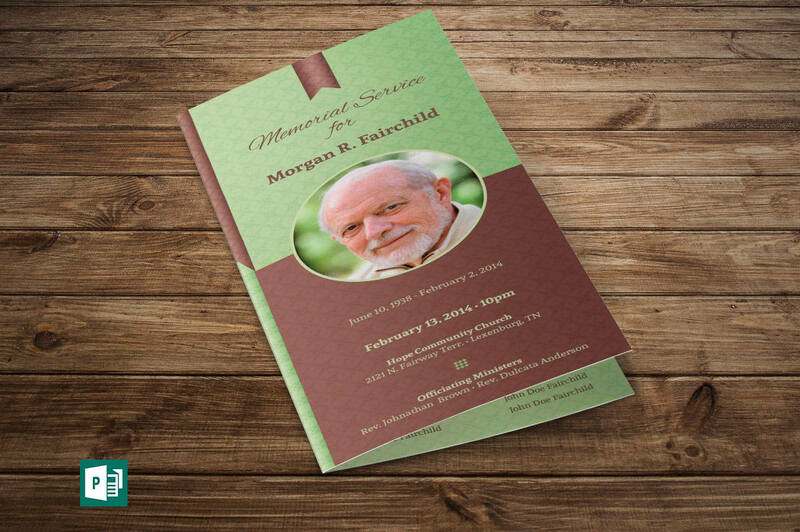 Green Regal Funeral Program Publisher Template is created in Microsoft Publisher Obituary Templates for a modern memorial or home going service. It’s gold decals and text style laid over a green paisley background will honor and dignify your loved ones. A great keepsake program. 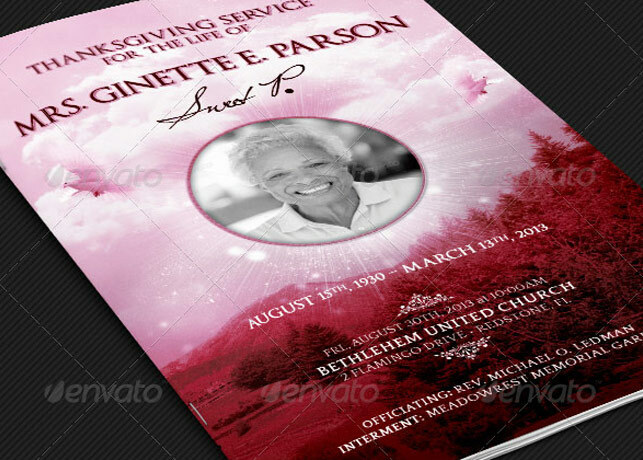 Black Silver Dignity Funeral Program Publisher Template is for a modern memorial or home going service. It’s silver decals and text style laid over a black background with paisley pattern will honor and dignify your loved ones. A great keepsake program. 4 color options are included for easy application. 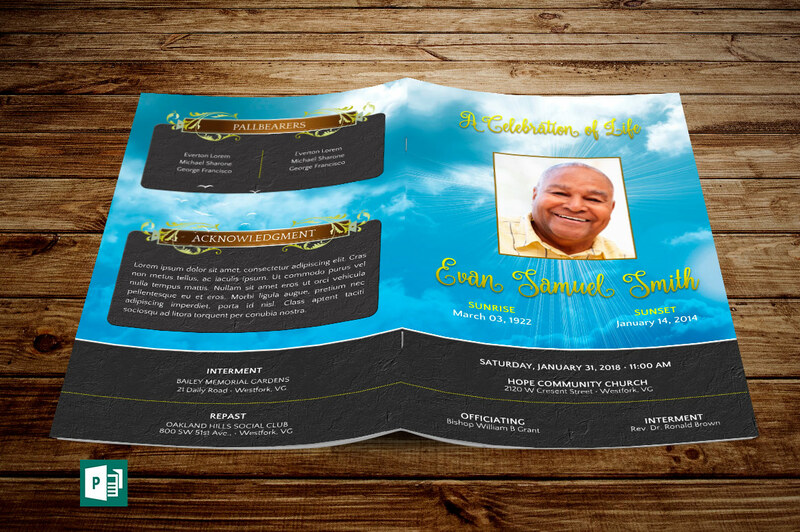 Goodbye Funeral Program Template, created with Photoshop, is a clean scrapbook style funeral or memorial program. Can also be edited for a wedding program. The earthy solid colors combined with your loved ones photos or images of their hobbies or special places, will makes this a special keepsake. All layers in the Photoshop files are arranged, color coded and simple to edit. Color options are included but you can edit the colors to fit your church or event branding. 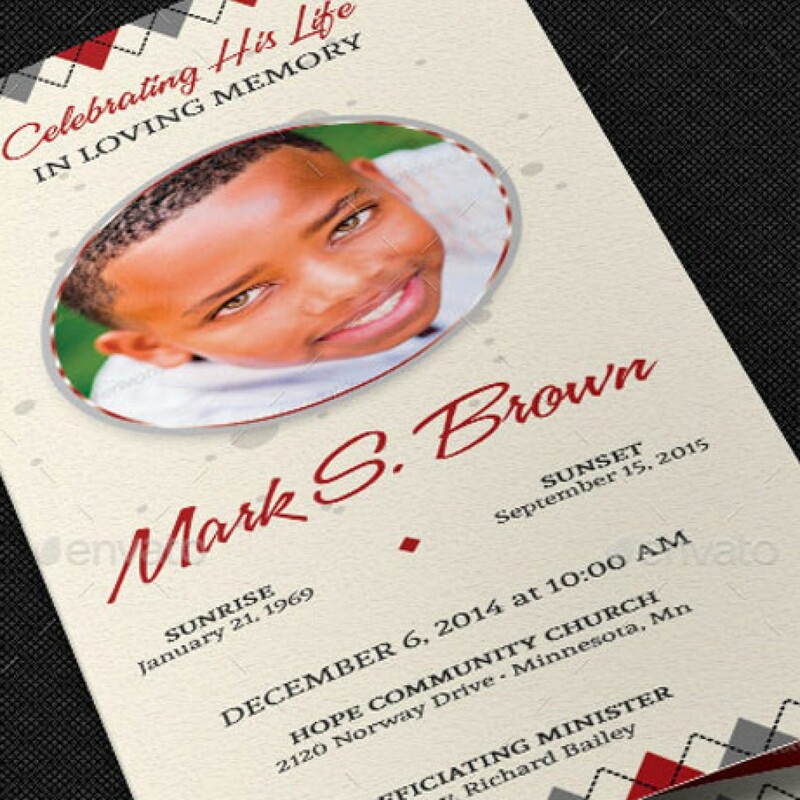 Floral Funeral Program Template, created with Photoshop, is for a memorial or funeral services. The watercolor flowers combined with decorative text, lends itself to this and many other occasions like weddings, anniversaries, baby showers etc. This program can also be edited and used as a greeting card. 4 color options are included for easy application. 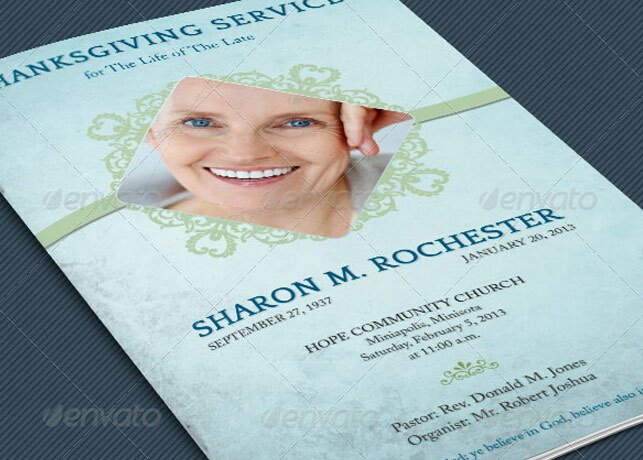 Blue Diamond Funeral Program Photoshop Template is for a modern memorial or home going service. It’s a blue and gray theme with diamond pattern and translucent photo boxes. A modern simplified program that will add dignify to your loved ones going home or memorial service. A great keepsake brochure. 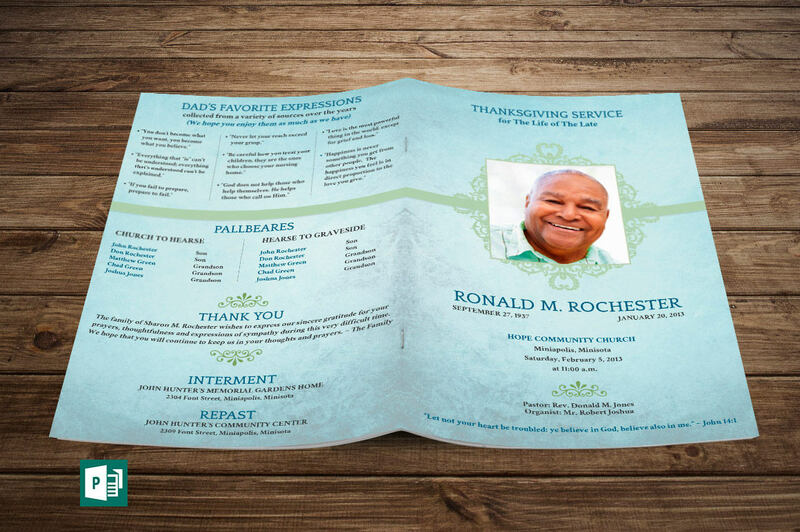 Dignity Funeral Program Publisher Template is for a modern memorial or home going service. It’s silver decals and text style laid over a blue background will honor and dignify your loved ones (5 Colors Included). A great keepsake program. 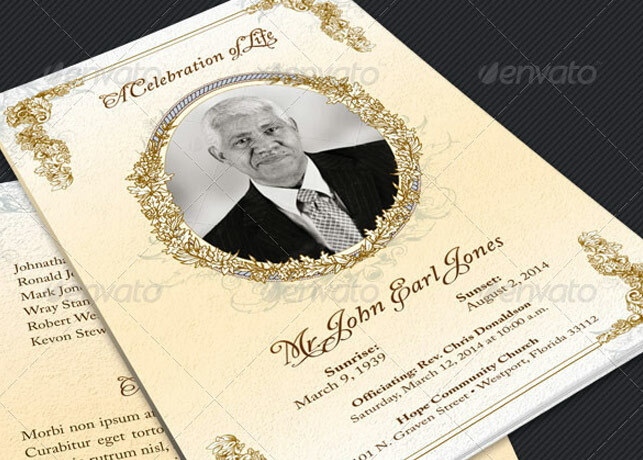 Regal Funeral Program Photoshop Template is for a modern memorial or home going service. 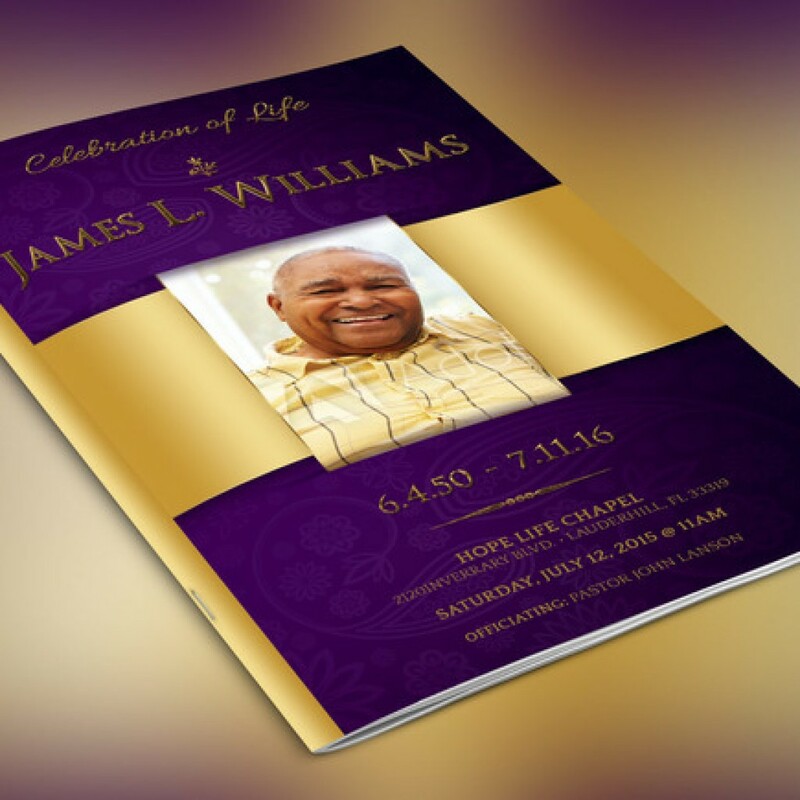 It’s gold decals and text style laid over a purple background will honor and dignify your loved ones. A great keepsake program. 4 color options are included for easy application. 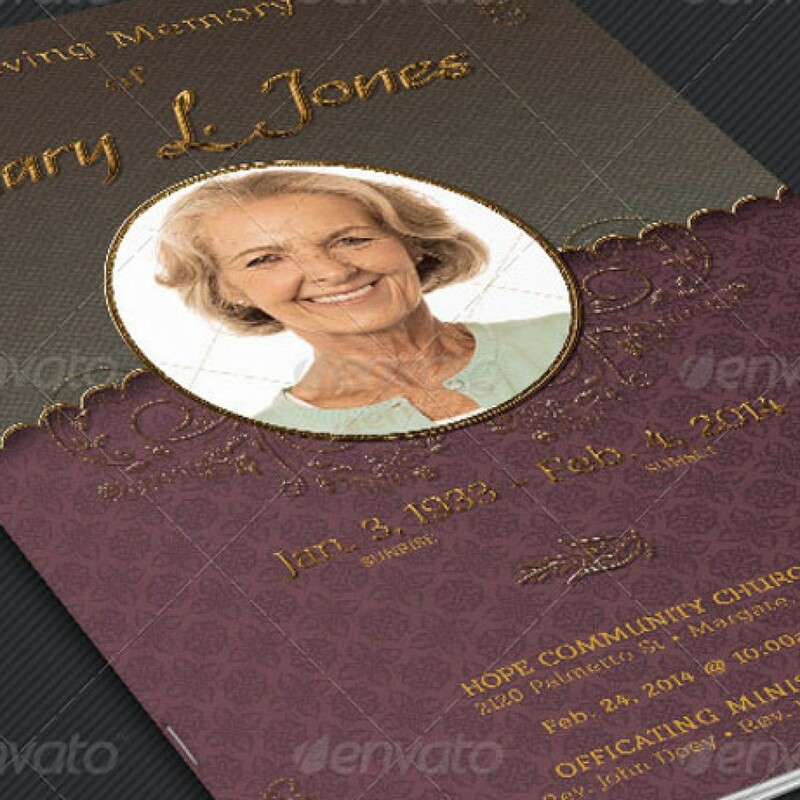 Solid Gold Funeral Program Photoshop Template is for a modern memorial or home going service. It’s gold decals and text style laid over a dark paisley background will honor and dignify your loved ones. A great keepsake program. 4 color options and 4 Photo Shape Option are included for easy customizing. Sunset Funeral Program Photoshop Template is for a modern memorial or home going service. It’s gold decals and text style laid over a sunset background will honor and dignify your loved ones. A great keepsake program. 4 color options and 4 Photo Shape Option are included for easy customizing. 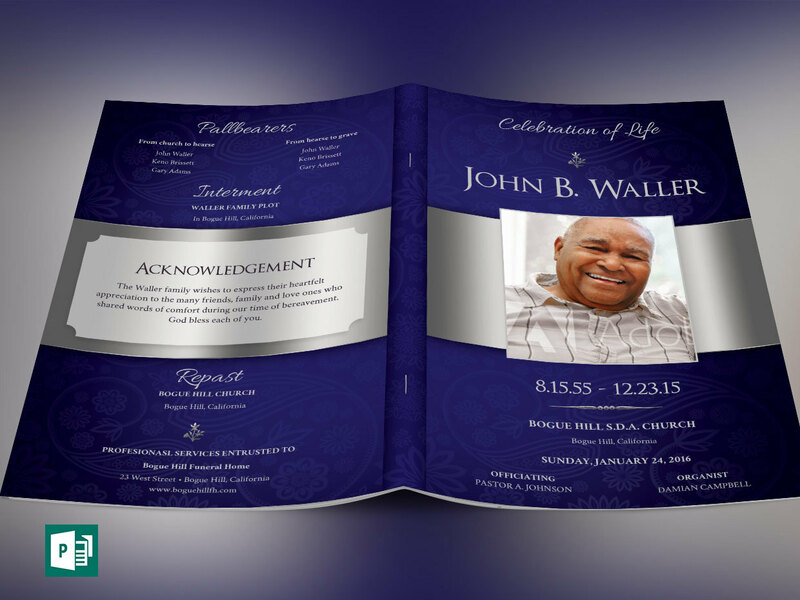 his funeral program template “Blue Rose” has been designed with a theme that matches the title. The beautiful hues of blues for the color palette gives a calm, and soothing feel to the eyes and spirit. 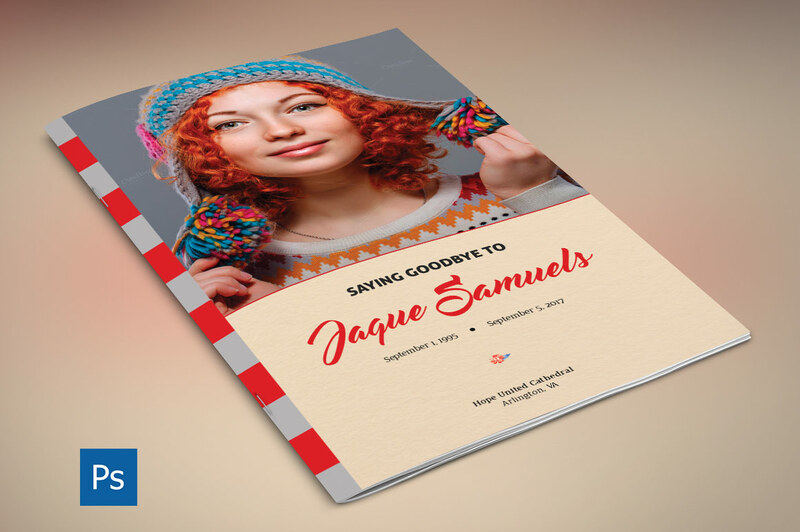 This 10 page template is perfect for those that have passed with graceful personalities. It also comes with unique page numbering, table of contents, and a full spread for family photos. It also comes with wonderful photos to match the theme. The cost is $15, a very reasonable price for the quality you’ll receive. 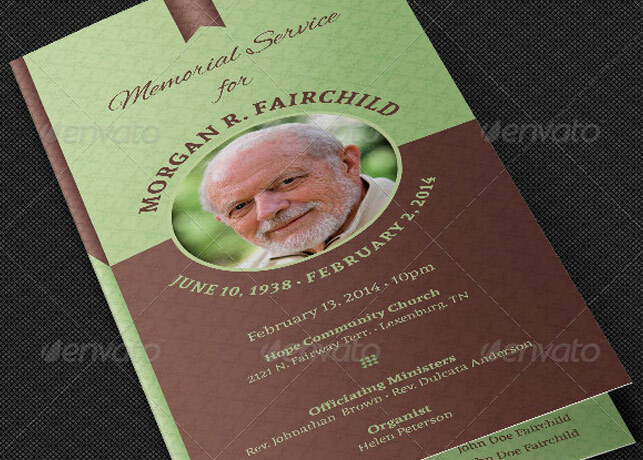 This “Leather Funeral Program” has a brown color palette a perfect fit for anyone who desires a simple modern layout, with a smooth chocolate colors. This clean 10 page design puts the power of flexibility in your hands. Add more pages or take away if you’d like, it’s all up to you and your imagination. There’s plenty of space for information, and photos for your event. You’ll find this file easy to use for a splendid and elegant presentation. 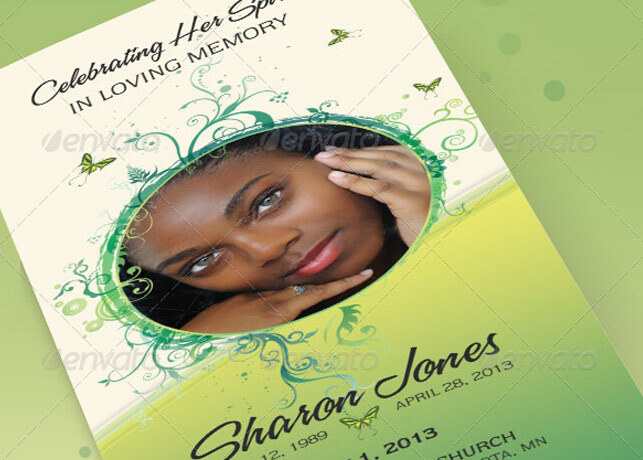 Petals Funeral Program Photoshop Template is for a memorial or funeral services. The soft colors and flowers combined with decorative text lends itself to many other occasions like weddings, anniversaries, baby showers etc. This program can also be edited and used as a greeting card. 4 color options are included for easy application. 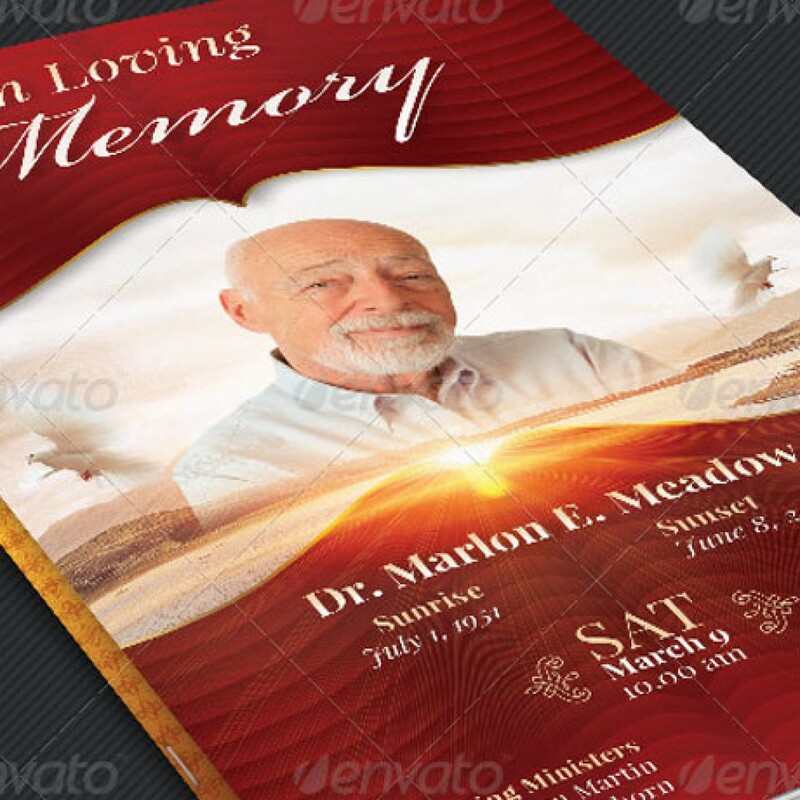 Abstract Funeral Program Template for a memorial or funeral services. Designed with vintage abstract patterns, vibrant colors and solid shapes. The combination of serif text, lends itself to this and many other occasions like weddings, anniversaries, baby showers etc. This program can also be edited and used as a greeting card. 8 color options are included for easy application. Vintage Funeral Program Photoshop Template for a memorial or funeral services. 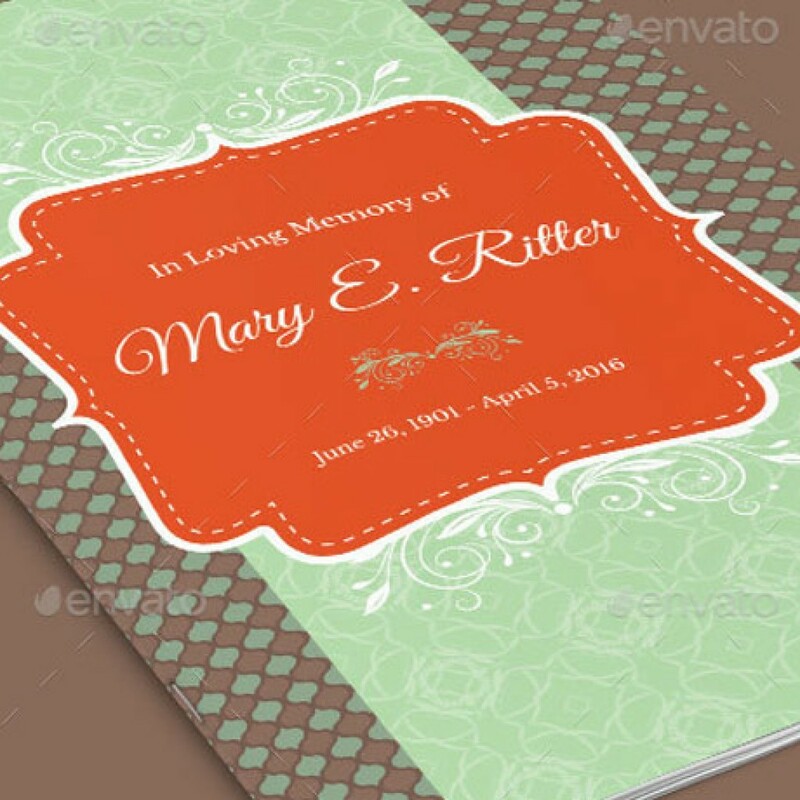 The vintage patterns, vibrant colors and solid shapes combined with serif text, lends itself to this and many other occasions like weddings, anniversaries, baby showers etc. This program can also be edited and used as a greeting card. 4 color options are included for easy application. 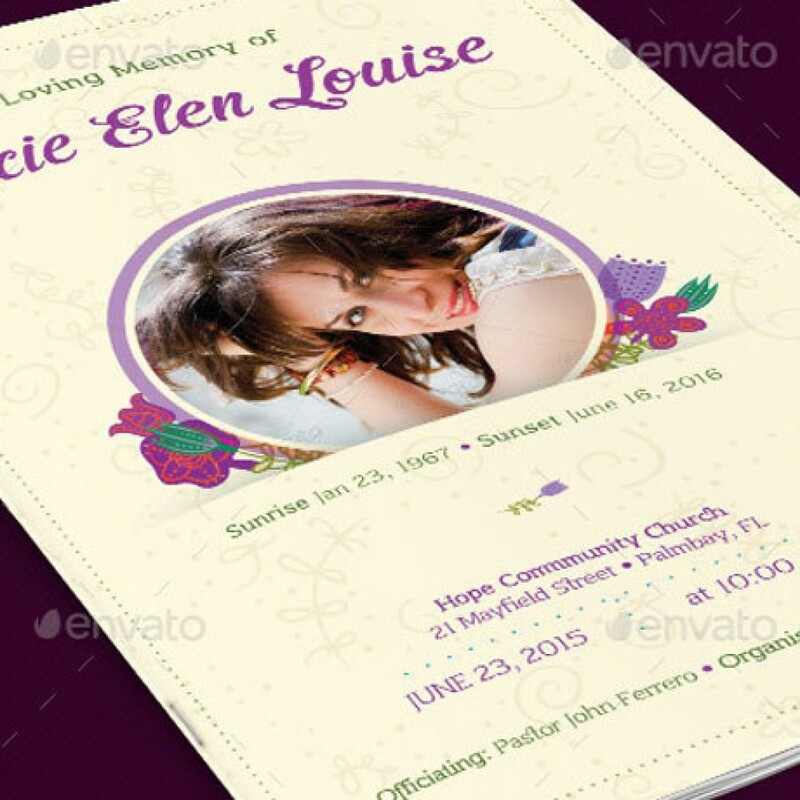 Floral Glory Funeral Program Template is designed with beautiful watercolor floral art, script fonts and a beige background. Great for Obituary Funeral Program, wedding programs, reception programs, church bulletins and more. Can be edited for a more masculine theme by changing the text, colors and patterns. 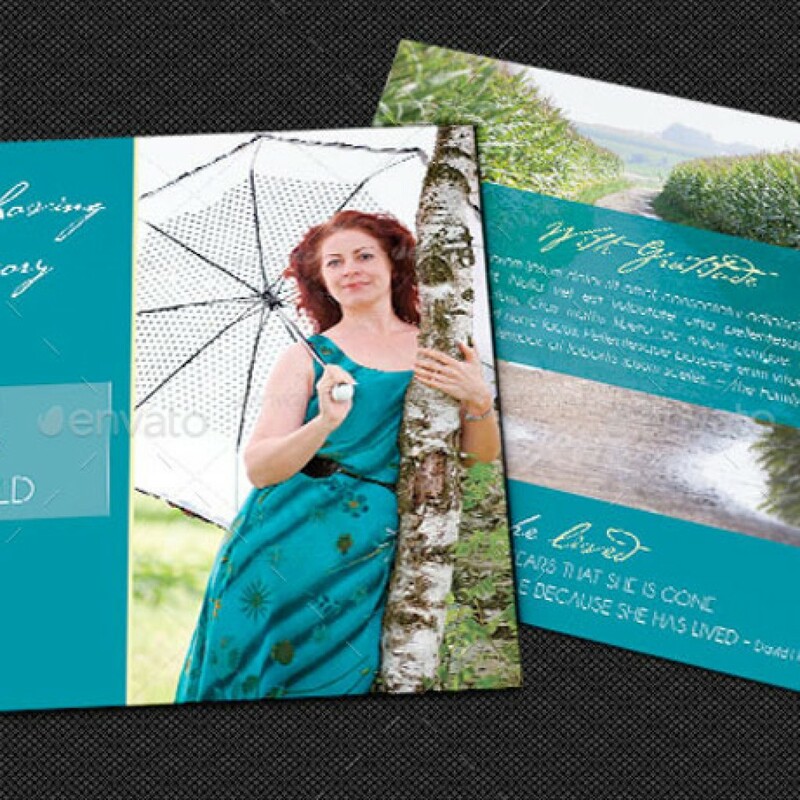 Turquoise Funeral Program Photoshop Template is bi-fold brochure for a memorial or funeral services. 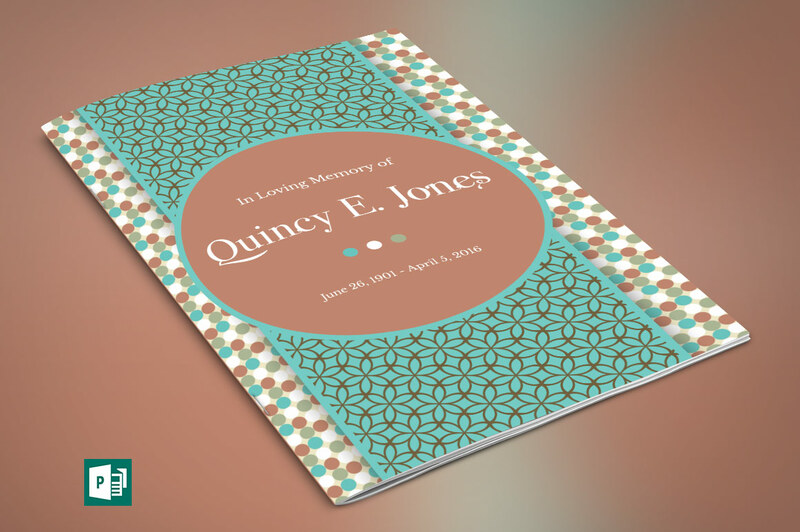 The polka dot patterns and solid shapes in this Obituary Funeral Program combined with serif text, makes the program suitable for other occasions like weddings, anniversaries, baby showers etc. This program can also be edited and used as a greeting card. 4 color options are included for easy application. 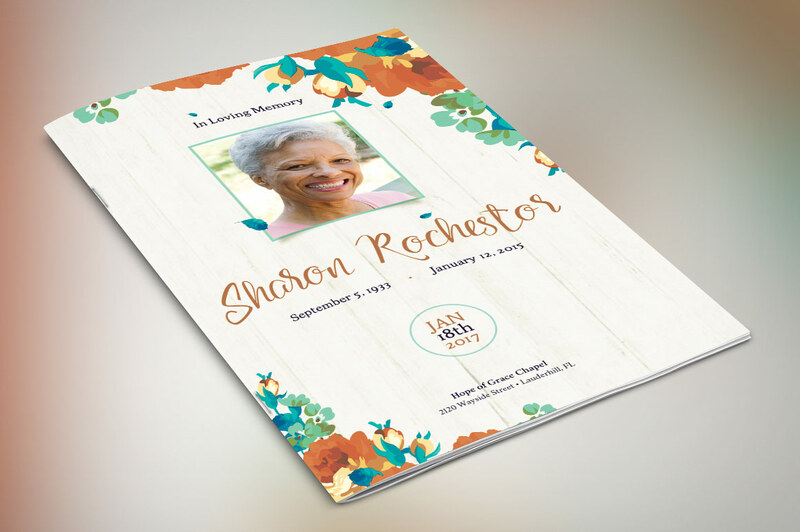 Watercolor Funeral Program Template is designed with beautiful watercolor floral art and beige parchment paper background. 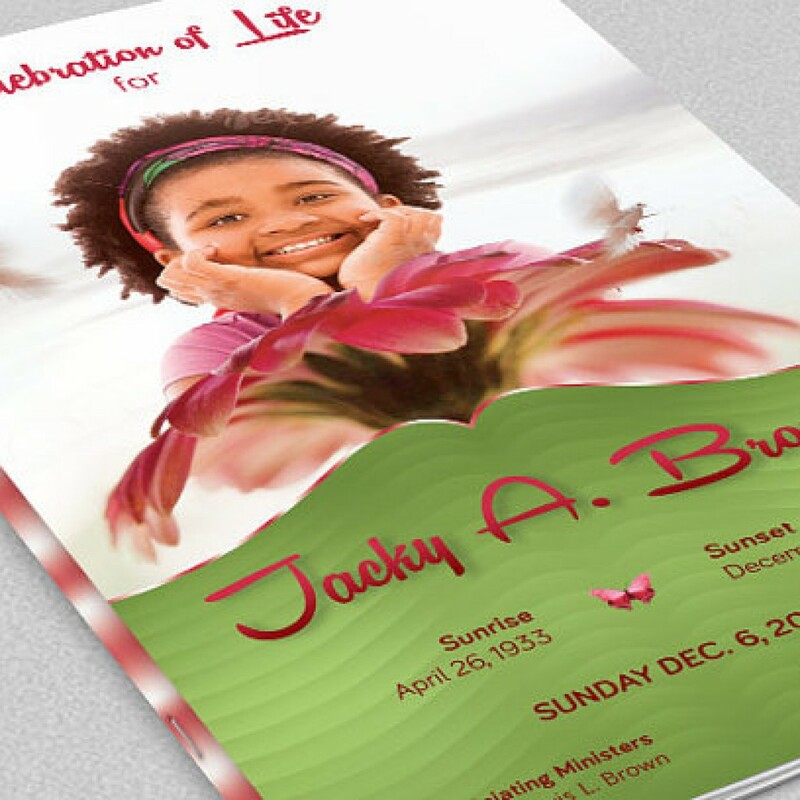 Great for Obituary Funeral Program, wedding programs, reception programs, church bulletins and more. Can be edited for other events throughout the year. 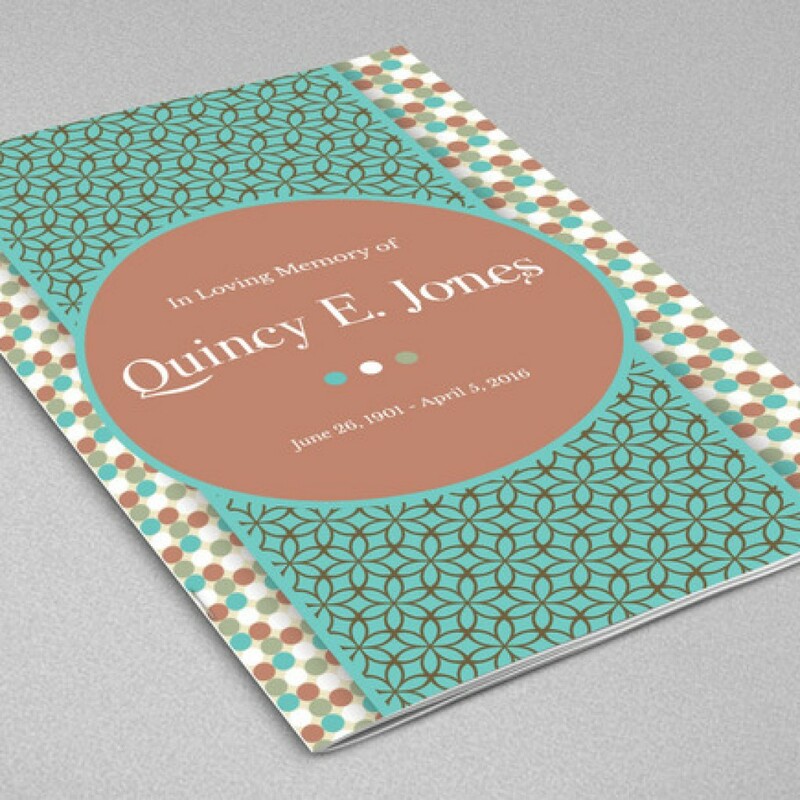 Watercolor Funeral Program Template Set has 2 programs designed with beautiful watercolor floral art and beige parchment paper background. Great for Obituary Funeral Program, wedding programs, reception programs, church bulletins and more. Can be edited for other events throughout the year. 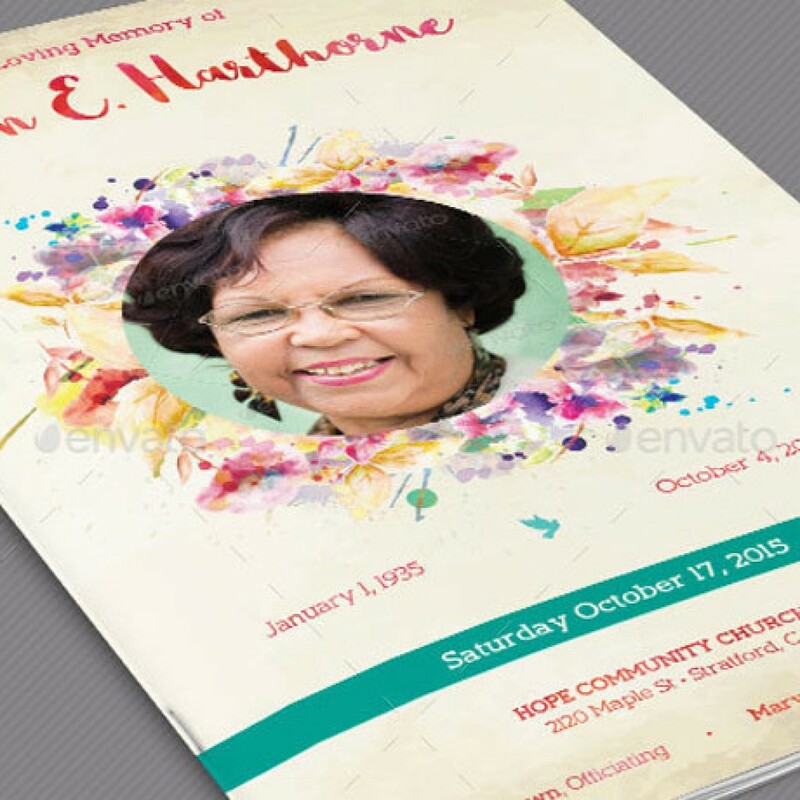 Home Going Funeral Program Publisher Template is for commemorative or home going service. Designed specifically for Obituary Funeral Program but can be edited for weddings etc. Decorated with beautiful ornaments and a beautiful texture. 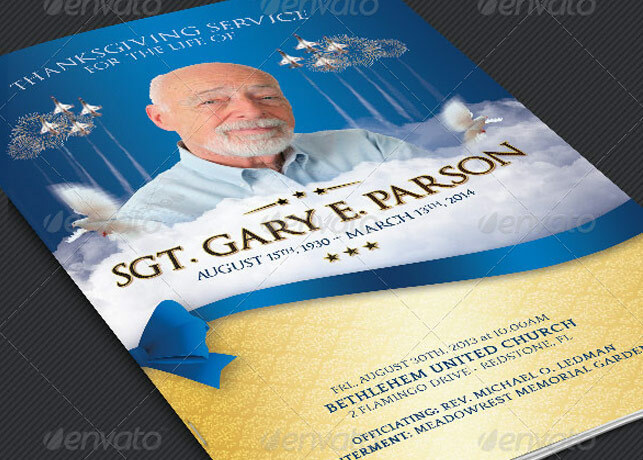 American Military Funeral Program Publisher Template is for the US Military memorial or funeral services. The symbolic colors with decorative text and imagery lends itself to this specific occasion. This Obituary Funeral Program can also be edited and used for Veterans Day, Memorial Day, Independence Day, 9/11 and other commemorative events. 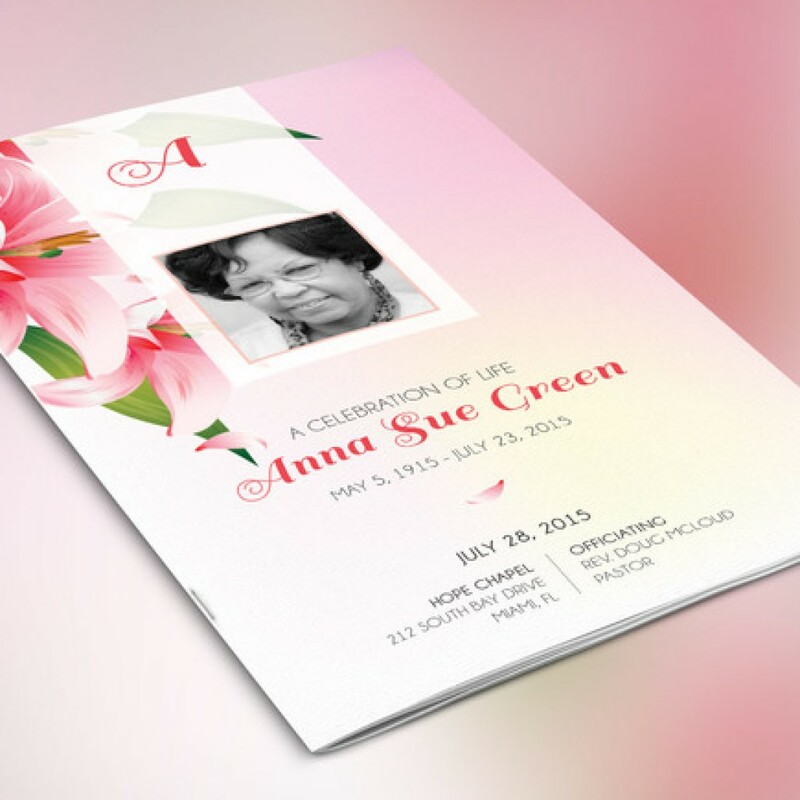 Scape Funeral Program Template is for a memorial or funeral services. The earthy colors and wooden texture combined with clean text lends itself to many other occasions like weddings, anniversaries, baby showers etc. This program can also be edited and used as a greeting card. 4 color options are included for easy application. 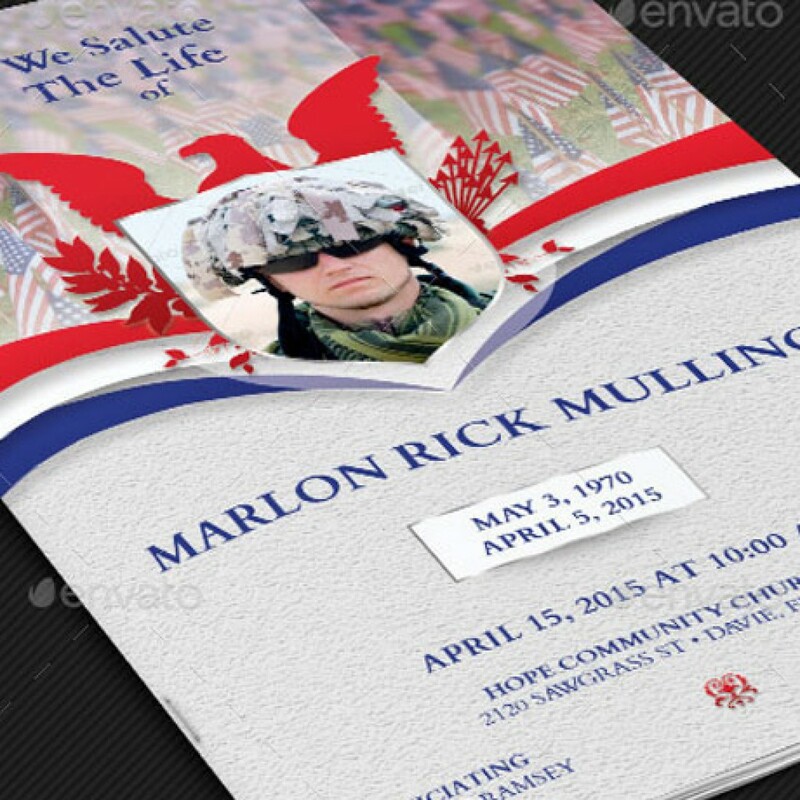 American Military Funeral Program Template is for the US Army, Marines, or Navy memorial or funeral services. The symbolic colors of each sectors combined with decorative text and imagery lends itself to this these specific occasion. This program can also be edited and used for Veterans Day, Memorial Day, Independence Day, 9/11 and other commemorative events. The “Cherry Funeral Program” has a modern layout and a background of cherry trees that gives this funeral program a sweet presentation. The color palette is modest, and the photo placements are simple and intuitive. 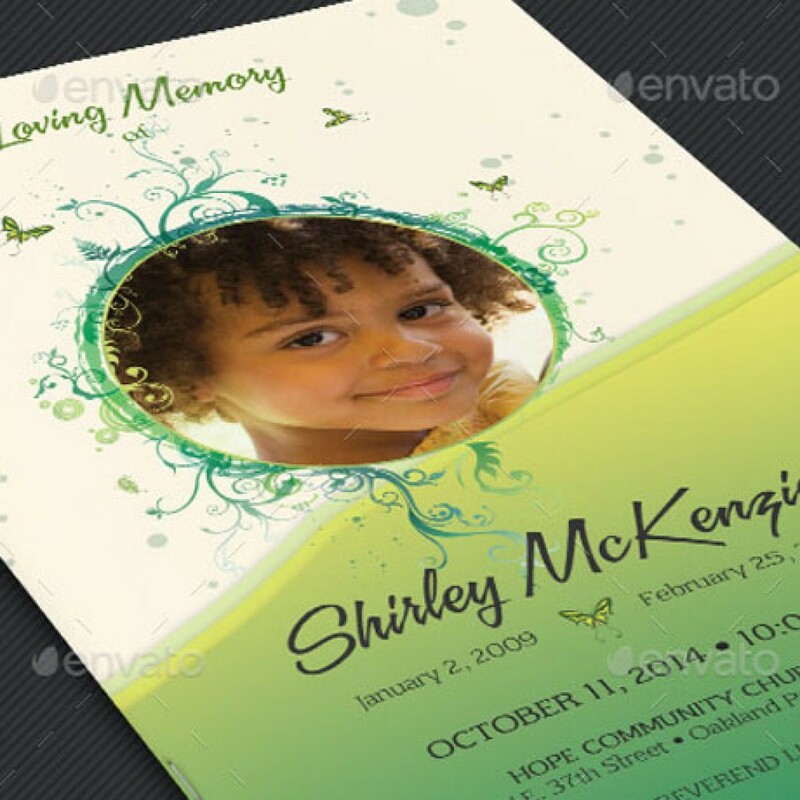 Download this one for an easy editing process. .
Child Funeral Program Photoshop Template is for children memorial or funeral services. The vibrant colors and flowers combined with decorative text lends itself to this occasion and will bring memories of happy days. Great for other occasions like birthday parties, weddings, anniversaries, baby showers etc. More pages means more options, this 10 page vintage design is created with a clean Victorian theme that will compliment a classic style. It comes with a secondary rose theme which carries the same Victorian era feel. The photo spread is minimal and antique looking, you’ll find it to be unique and engaging to the eye. Customize this flexible file in multiple ways. This design is made to give you the highest quality when printed for a solid presentation. 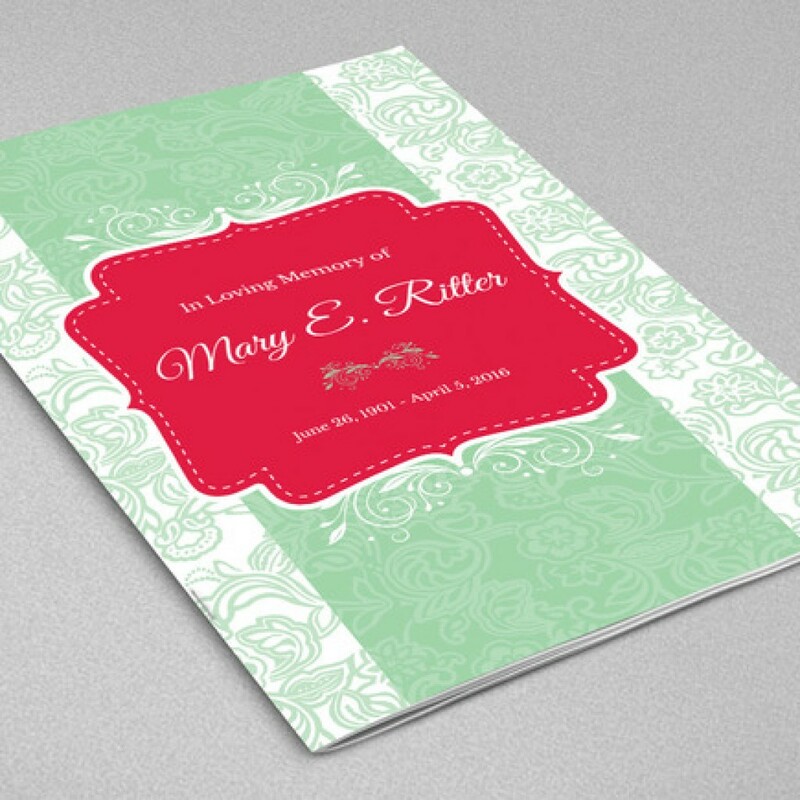 A clean design with a pink and coral blue color palette to match the theme. 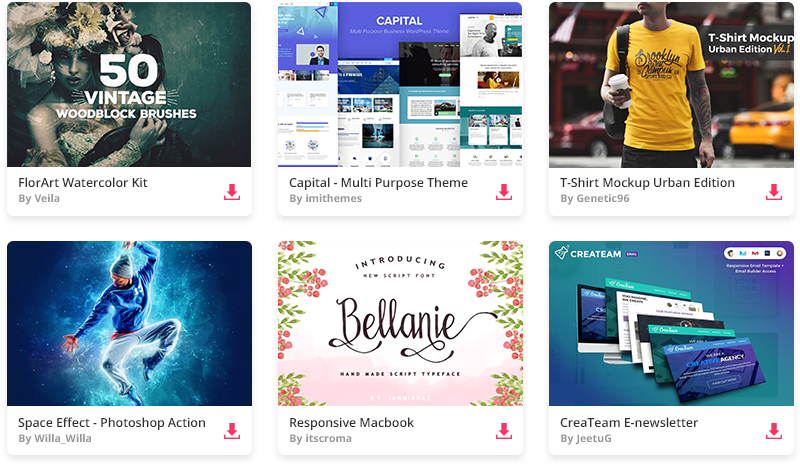 Feel the power of customization with this ten page layout. You can use all ten or detract from them, if you want to go big add more pages to maximize your creativity. This file is easy to use and will give you a wonderful, clean presentation. Customize this flexible file in multiple ways. 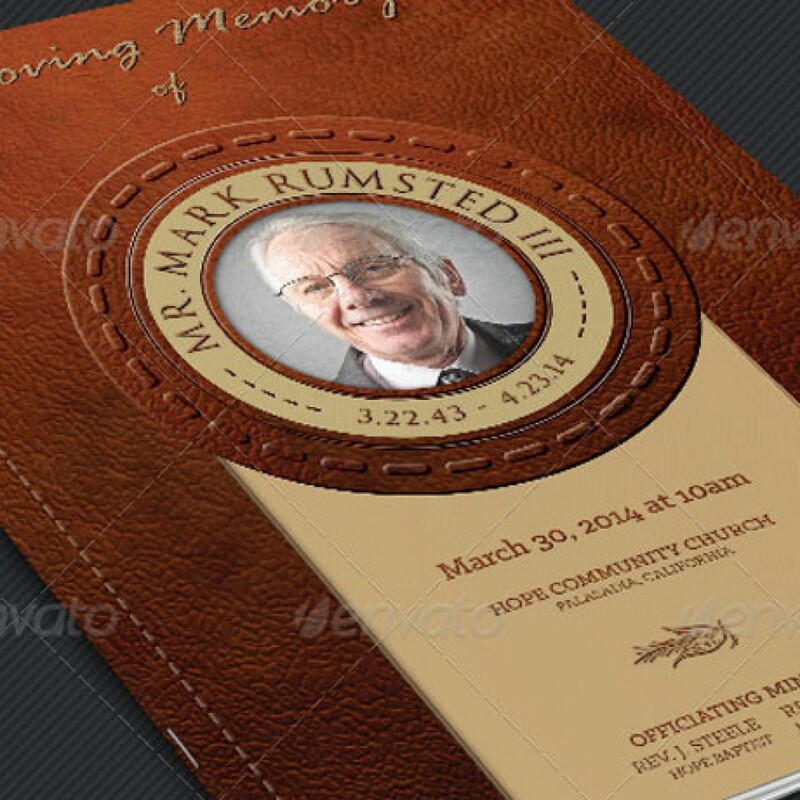 Leather Funeral Program Template – 4 Pages is for a modern commemorative or home going service that desire a vintage touch. It’s leather texture, bevels, stitches and cut outs will give your special day a dignified feel for your loved one. 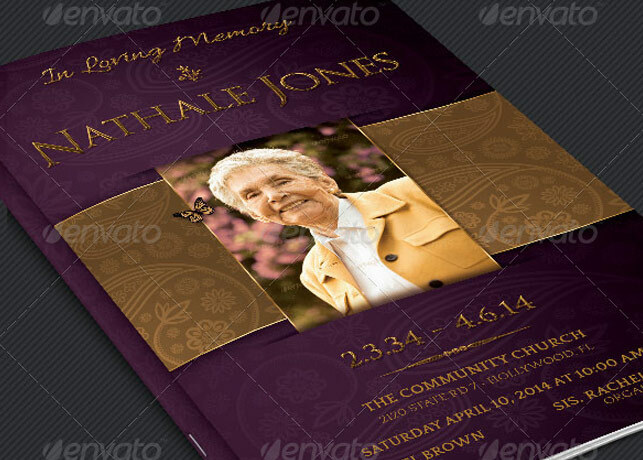 Vintage Funeral Service Program Template is for a modern commemorative or home going service that desire a vintage touch. It’s gold decals and text style laid over a decorative background will honor and dignify your loved ones. 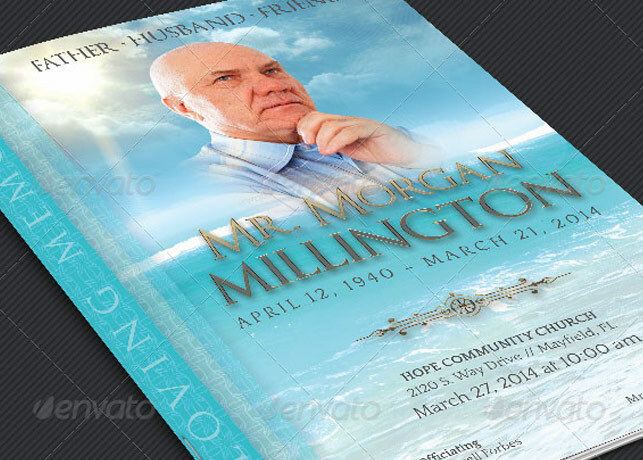 Oceanic Funeral Program Large Template – 4 Pages is 8.5”x11” and has an oceanic theme which is ideal for a modern commemorative or home going service. Designed specifically for funerals, but can be edited for other events like weddings and receptions. 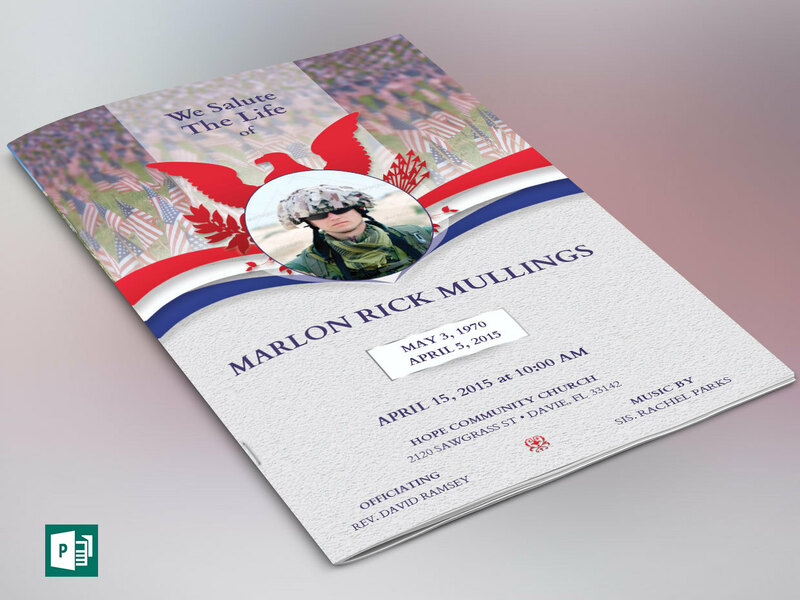 Military Funeral Service Program Template is for a modern commemorative or home going service. Designed specifically for military funerals but can be edited for other funerals and events like weddings and receptions. 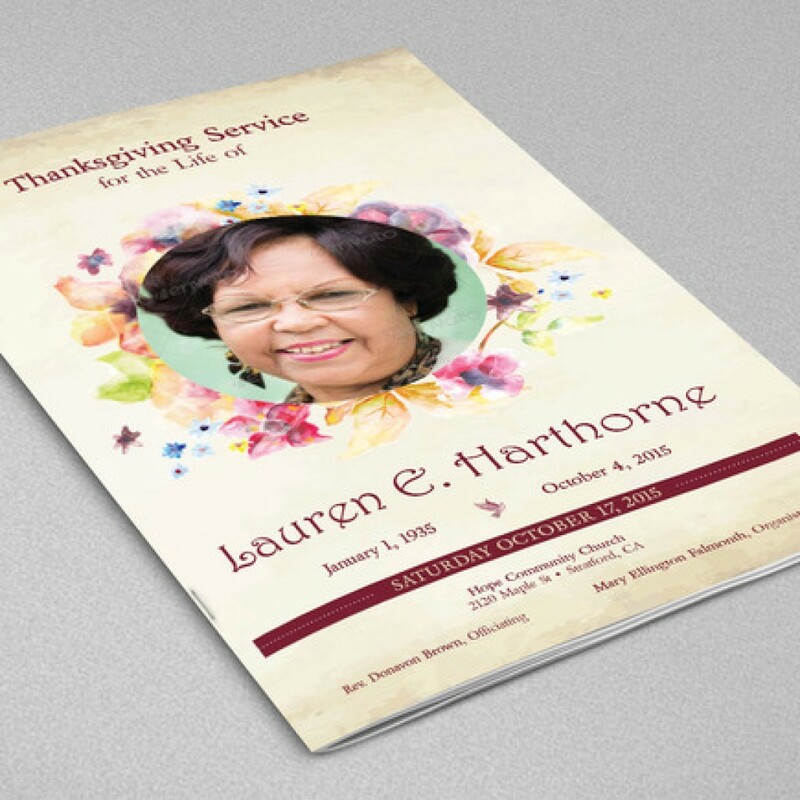 Pink Thanksgiving Funeral Program Template is for Memorial or Home Going Services. Designed specifically for funerals, but can be edited for weddings etc. Decorated with beautiful ornaments, doves and a flourishing landscape. A great memorial keepsake. 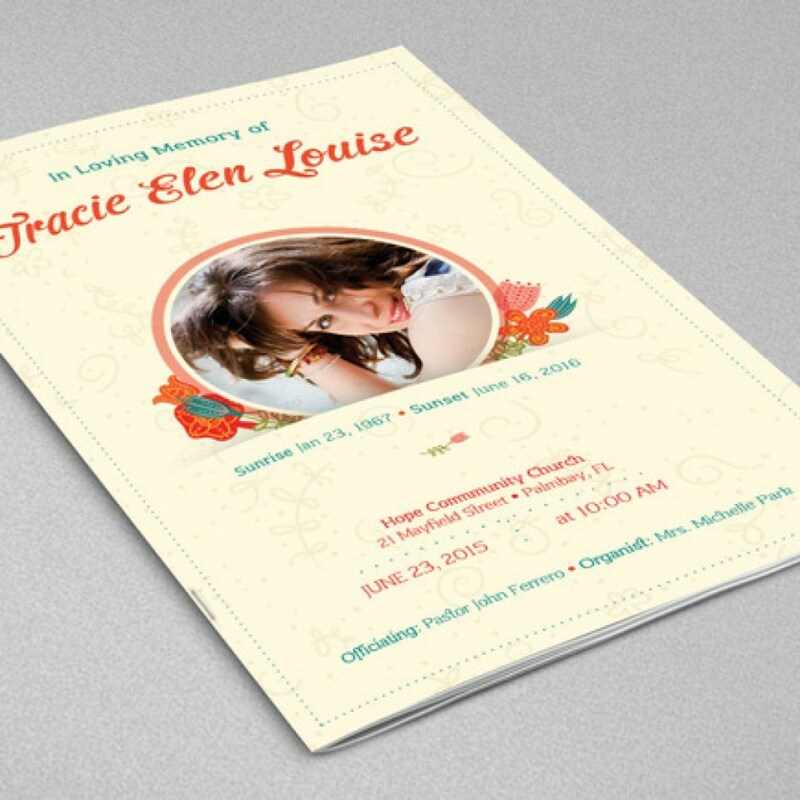 Oriental Style Bi-fold Funeral Program Template is for a memorial or home going service. 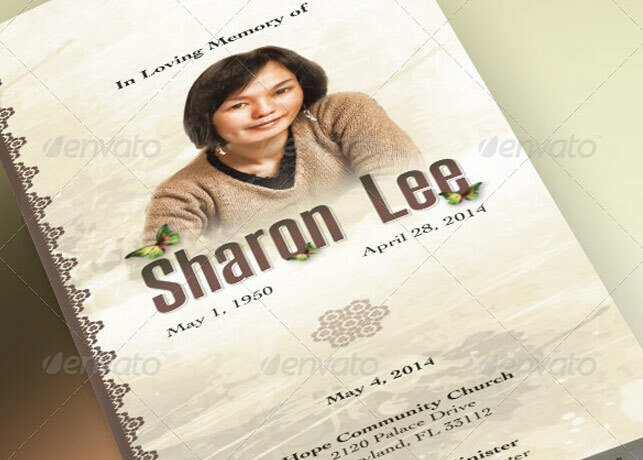 The decorative Obituary Funeral Program with painted background and Chinese lamps, lends itself to many other occasions like weddings, baby showers etc. Sold exclusively on graphicriver.net. Victorian Funeral Program Template for Photoshop and Microsoft Publisher is for commemorative or home going service. Designed specifically for Obituary Funeral Program but can be edited for weddings etc. Decorated with beautiful victorian ornaments. 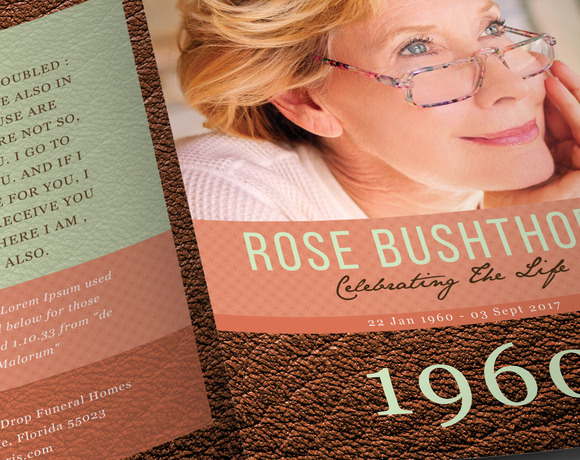 Vintage Style Funeral Program Template is for a modern commemorative or home going service. Designed specifically for male Obituary Funeral Program but can be edited for female funerals and other events like weddings and receptions. 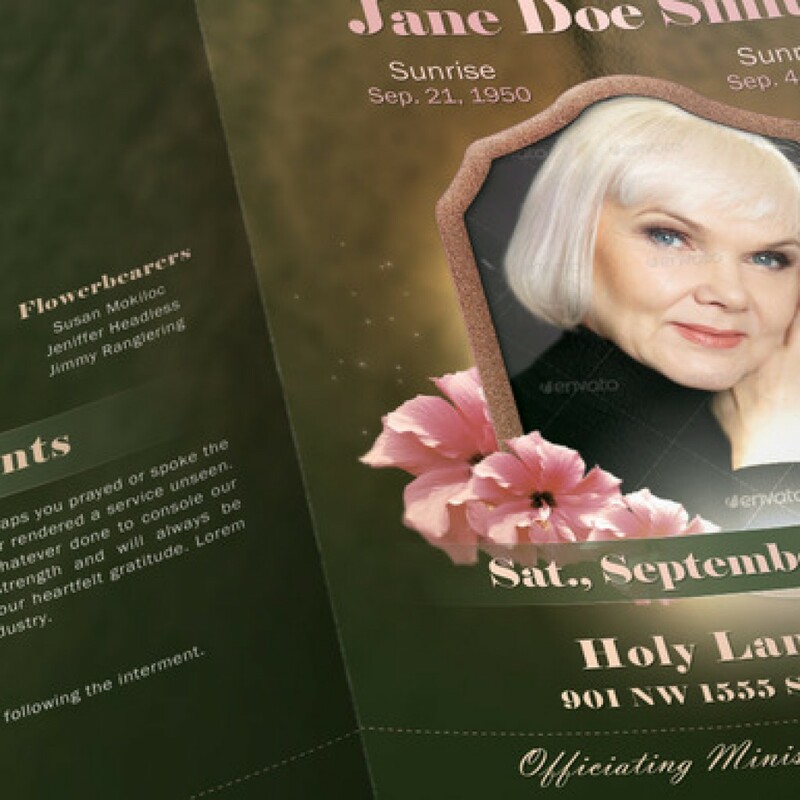 Roses Funeral Program Photoshop Template is for a modern commemorative or going home service. Designed specifically for funerals but can be edited for weddings etc. 4 one-click color options are included. In this package you’ll find 2 Photoshop file. A great value. All layers in the files are arranged, color coded and simple to edit. 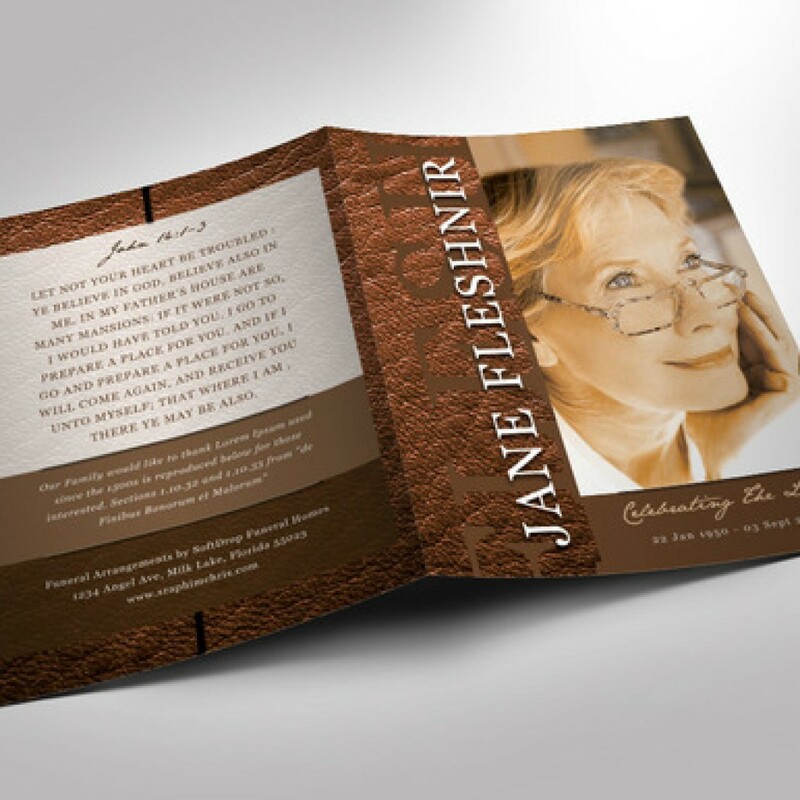 This “Leather Funeral Program” marks the first of its kind with a color palette that gleams a beautiful contrast above the brown leather texture. This modern Obituary Funeral Program still feels classic with a 10 page spread which is very easy to edit. It comes with areas for songs, poems and family photos along with traditional areas for information. The great outcome will be well worth the investment and will give you a wonderful, clean presentation. Customize this flexible file in multiple ways. 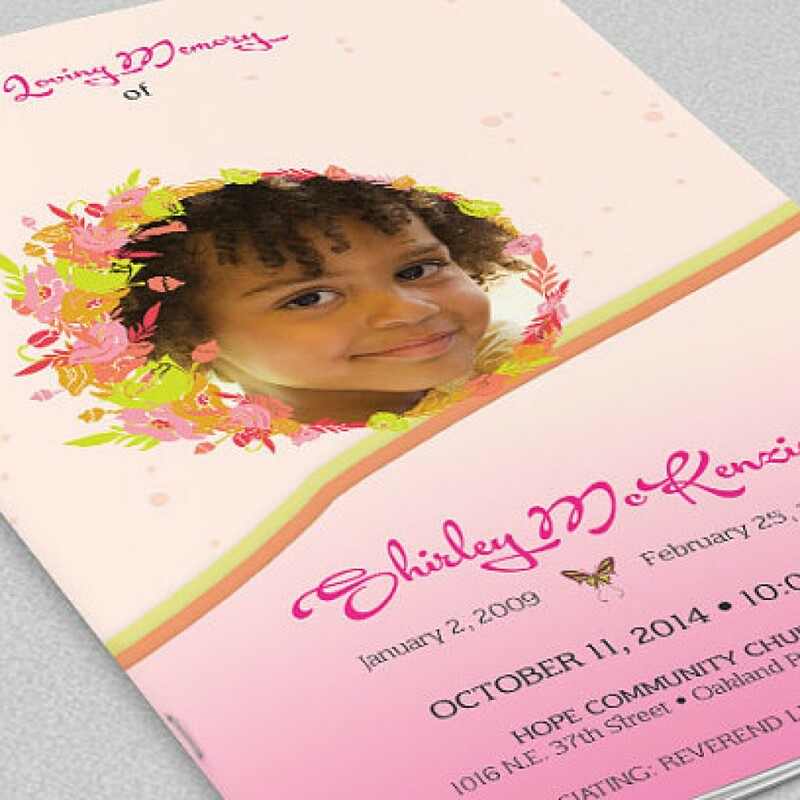 Hibiscus Bi-fold Funeral Program Photoshop Template is for a memorial or funeral services. 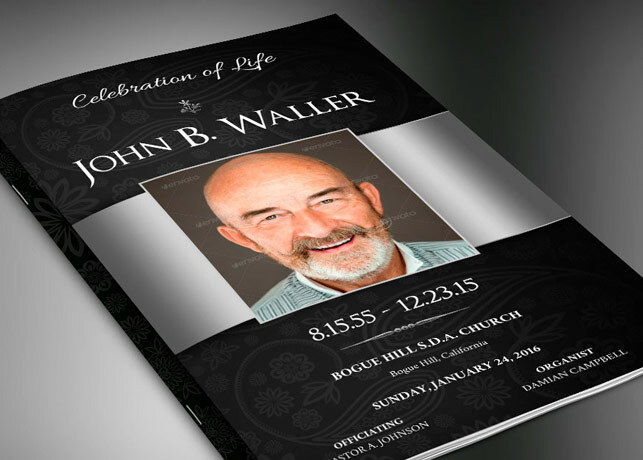 The watercolor Obituary Templates with floral pattern and solid shapes combined with serif text, lends itself to this and many other occasions. Use it for weddings, anniversaries, baby showers etc. This program can also be edited and used as a greeting card. 4 alternate color options are included for easy application. 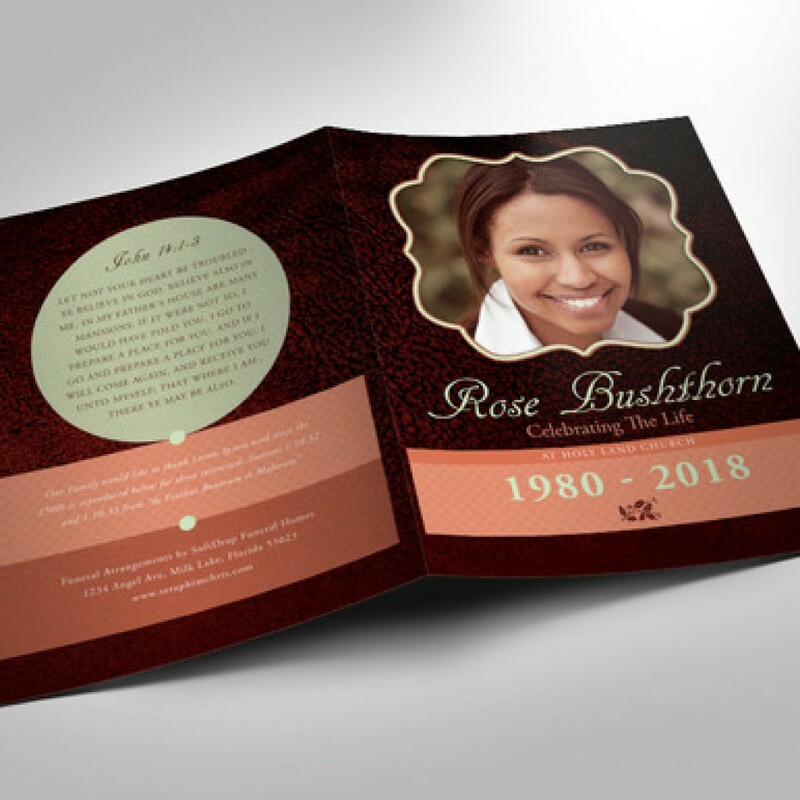 Pink Rose Funeral Program Photoshop Obituary Templates is for a commemorative or home going funeral service. Obituary Templates designed specifically for funerals but can be edited for weddings etc. 4 one-click color options are included. In this package you’ll find 4 Photoshop file and an Indesign File. A great value. 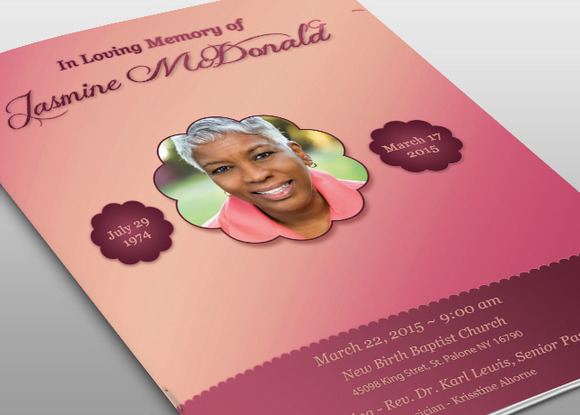 All layers in this funeral program template are arranged, color coded and simple to edit. 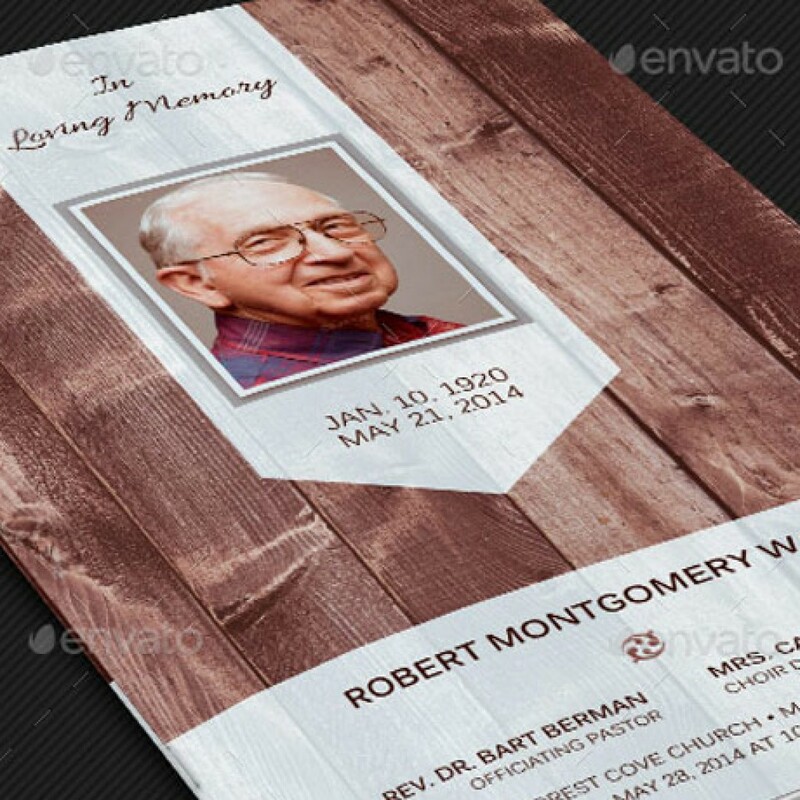 Memorial Funeral Obituary Templates is great for any memorial or funeral event. In this package you’ll find four 11×17″ Photoshop files (Final size of file when trimmed and folded is 8.5×11″). All text and graphics in the files are editable, color coded and simple to edit. The files also contain seven one-click color options. Models are not included. 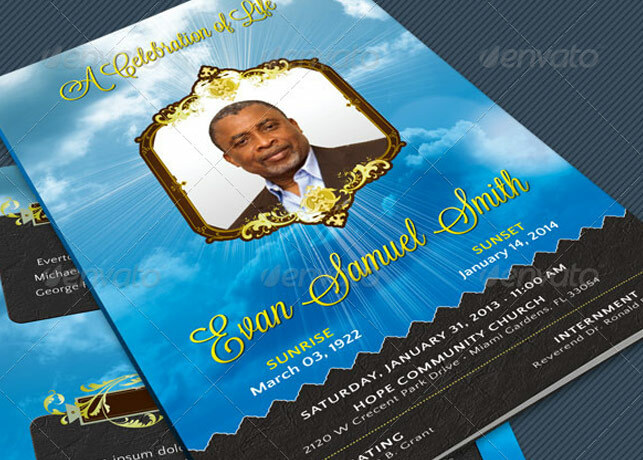 Blue Texture Funeral Program Publisher Obituary Templates is for commemorative or home going funeral service. Designed specifically for funerals but can be edited for weddings etc. Decorated with beautiful green Victorian ornaments and textures. This program is perfect for both male and female. 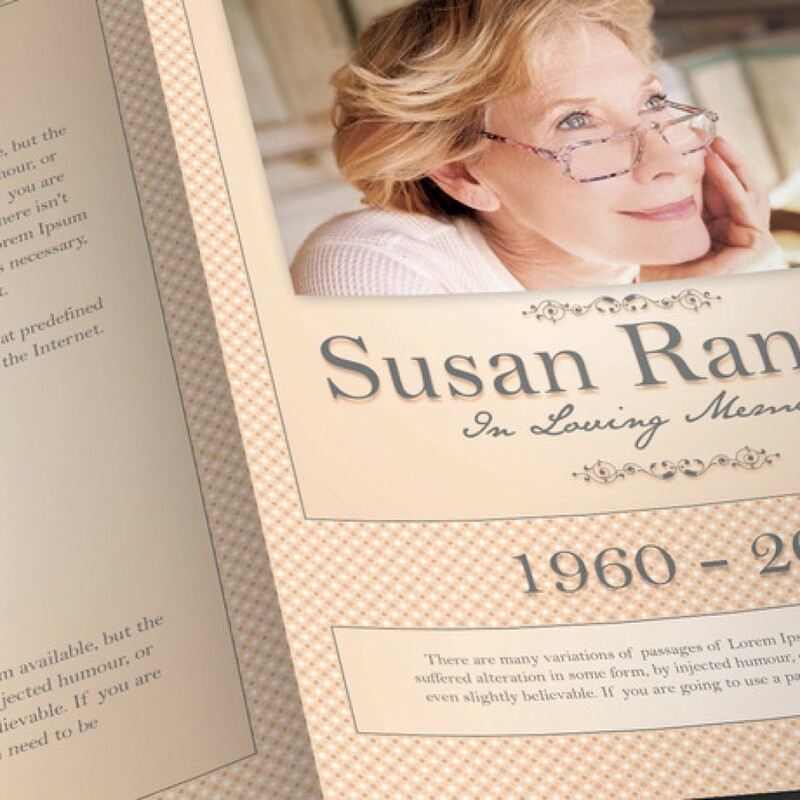 Dignify your loved one’s memorial or funeral service with this elegant brochure. 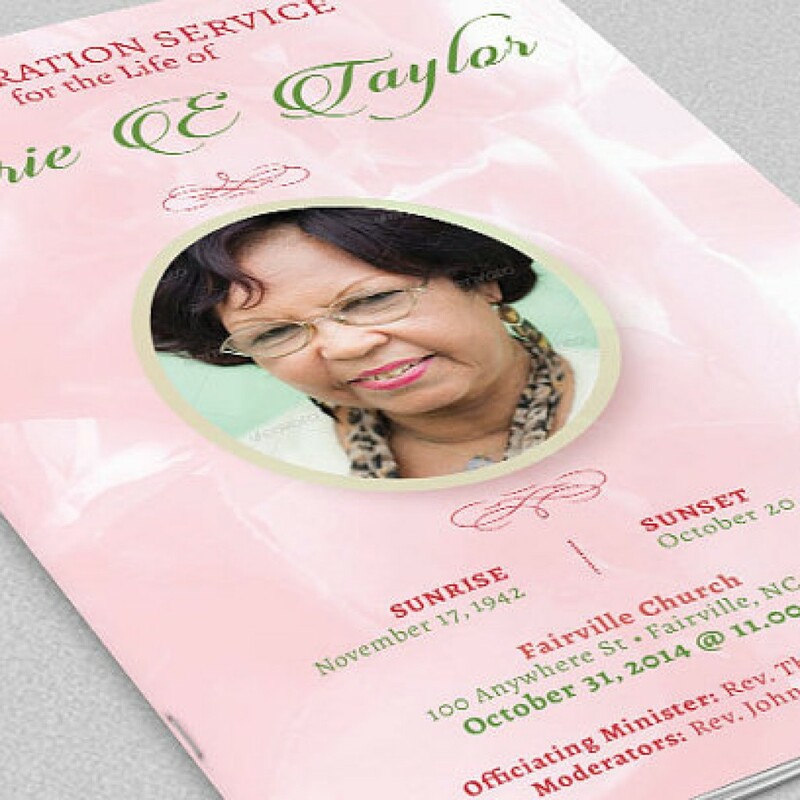 Bi-fold Funeral Program Publisher Obituary Templates is geared is for a modern commemorative or home going service. Design with a green pattern background with modern serif type. The decorative design lends itself to many other occasions like weddings, baby showers etc.